1. Cut the chicken breast into bite sized pieces and pop into a bowl with the five spice, mix so the spice covers all of the chicken. 3. In a large mixing bowl bring together the spring onions, coriander, mango, lime juice, macadamia nuts, pea shoots (or watercress) and finally the cooked chicken. 4.Toss to combine and serve immediately. 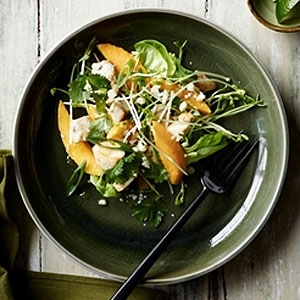 Recipe by Tobie Puttock for Australian Regional Food’s Mango campaign. 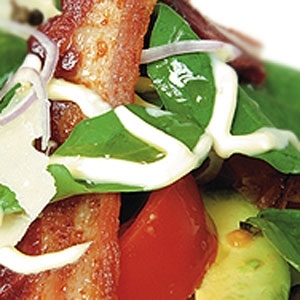 A fresh and juicy salad, texturely appetizing with the crisp bacon and soft avocado a real delight. 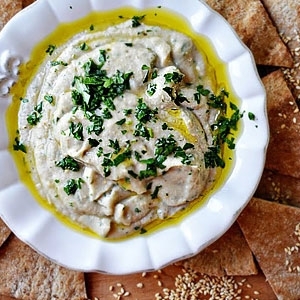 Simple and smoky, this dip is ideal with pita chips or oven baked flatbread pieces. 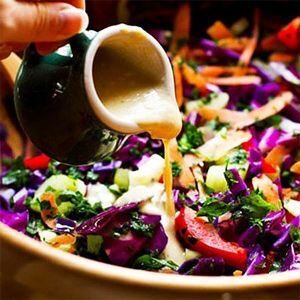 Use a lemon based creamy dressing to complement the salad.